blog home Military Defense What is Insubordination in the Military? What is Insubordination in the Military? If you have been accused of insubordination as a member of the military, the repercussions can entirely derail your career and plans for the future. Every branch of the military follows a chain of command in order to maintain accountability, efficiency, and organization. When a service member disobeys the chain of command in some manner, he or she may face severe consequences. Assaulting a Superior Officer – It is prohibited for any service member to threaten violence or physically strike a superior officer, such as yelling, gesturing, brandishing a weapon, or intentional touching. 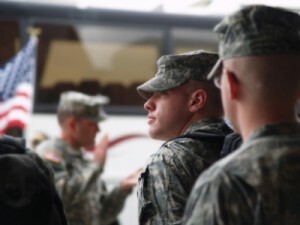 Disobeying a Lawful Order – A service member is prohibited from disobeying instruction from a superior officer that contains a command pertaining to the individual’s military duty by failing to carry out the order. Treating a Superior Officer with Disrespect – Failing to properly salute a superior, using obscene language to describe a superior officer, or openly mocking a superior is not allowed. It does not matter if the superior officer is not present for the disrespectful behavior. The punishments for insubordination include forfeiture of pay, dishonorable discharge, or a maximum penalty of confinement for three months to five years. If you are facing any degree of court martial, it is imperative that you consult with an experienced San Diego military defense lawyer. Attorney Joseph H. Low IV is a military Veteran with a successful track record for protecting the rights of service members. With a skilled legal representative on your side, it may be possible to have the charges against you reduced or dropped. Please do not wait to contact The Law Firm of Joseph H. Low IV to receive a free and confidential consultation.